Commercial printing, Business Forms, Calendars, Internet Marketing, Graphic Design, Copying Services, Signs, Other Services - folding, binding, perforating, numbering, padding, laminating and bulk mailing. The BEST place for people around the globe to plan and book fishing and hunting trips to Canada. Join us in several great Midwest US markets. Come see us for all your building supply needs! We have renovated our store and offer a great selection of building materials, hardware, paints, stains, and electrical supplies, cleaning supples, plumbing, and housewares. We stock a large inventory of common trusses. We do manufacture trusses on our site and are able to build your trusses and also prefab your walls for easier construction. We can also prefab your floating docks no matter what the configuration. At BDO, we help individuals and businesses achieve success by offering a breadth of expertise, innovative thinking, and valuable insight to every client who walks through our doors.BDO has 90 years of experience providing value-added assurance, accounting, taxation and advisory services. It's about time! Discover why Bearskin airlines if your #1 choice. Let the Bear take you there. Today, the "Bear" continues to offer more than 100 departures daily to 18 destinations in Ontario and Manitoba. BEST WESTERN PLUS Dryden Hotel & Conference Centre is located on the Trans-Canada Highway 17 in Dryden, only minutes from the downtown shopping centre, excellent golfing, curling, snow mobiling and some of the best fishing spots in Canada. Our location is easily accessible from all highways and includes a helicopter landing pad. We have plenty of free parking for hotel, banquet and restaurant guests. Excellent accommodations, friendly, attentive service. As Dryden's only full service hotel each spacious, well designed room features all the right amenities that make a difference while traveling. All suites include a 30-inch flat panel TV. Relax in our pool after a long day, warm up in our steam room or hot tub, or if you prefer you can work out in our exercise room. This winter, experience the ultimate Canadian adventure... join Borealis for a Dog Sled trip through spectacular Northwestern Ontario. Ingredients for Life. Offering bake shop, floral, deli, fresh meats, produce, and groceries, and Starbucks coffee shop. Lodge Vault Software - Lodge Vault is a property managment system for resorts, lodges, and other small businesses in the hospitality industry. It provides word processing, customer resource management, accounting, and reservation management functionality all in one easy-to-use desktop application. Locations in Vermilion Bay - Hwy 17 and Dryden - 35 King St. Casually Hip Way North is a clothing boutique, holiday gifts shop, gift shop and presents boutique. Your friendly Hosts Pauline & Michel would like to invite you to spend a night or a week at affordable prices and excellent accommodations. We would like to make your visit to Dryden a memorable one by offering great service and beautiful scenery. With all the beautiful scenery around Dryden it isn't a surprise to find a picture perfect water fall and rushing river right behind our Motel. The view out your back window is spectacular and you are only a 3 minute walk from downtown. Dark Water Developments collectively has over 50 years of experience in the tourism and Retail Marketing fields. We believe in a proactive approach to product evaluation and promotion. Automotive sales, leasing, parts & service. Marine Sales and Service. Our 3 locations Kenora, Dryden & Sioux Lookout are here to serve you. Domtar produces a wide variety of products from mills in United States and Canada. Our products include Northern Softwoods valued for excellent strength properties, southern fluff valued for its low fiberization energy, and several southern and northern hardwood grades providing a range of bulk, strength and porosity properties. We have a history of developing new and innovative products in response to the changing and growing needs of our customers. Along with our broad product line, Domtar has a sales and technical service team that works together with the mills to ensure our customers receive the products they need and the services they require. The Dryden & District Museum is dedicated to the promotion and preservation of local culture and history in the Dryden area. Various artifacts and theme rooms are displayed. Guided tours are available. For all your grocery needs. Featuring bakery, deli, coffee shop, movie rentals, fresh produce and meat. "Where Customers Send Their Friends" is more than a slogan at Dryden GM. Every day our friendly and professional staff works hard to earn your confidence by delivering outstanding customer satisfaction, and the best vehicle selection and service in the region. We stock a wide variety of new Chevrolet, Buick and GMC vehicles, as well as the region's largest inventory of Optimum Certified used trucks and cars. With twelve service bays, and a fully stocked parts department, our factory trained technicians are ready to care for all your service needs. We also have a great selection of accessories to customize your vehicle. Those are just a few reasons why Customers continue sending their friends to Dryden GM. The Dryden Municipal Telephone System is a full service, Municipality wholly owned, Telephone Company. We provide: Business System Installation, Maintenance and service for all Business Solutions. DMTS is Certified in Fiber Optic Service and Installation as well as Digital and IP Telephone Systems. If your business is in need of a new system or just an additional phone, we are here to service Northwestern Ontario. Cellular Service to all residents of the general area, Sales and Leasing of Globalstar Satellite Telephones and Sales & Internet Service to the general area, with High Speed DSL in Dryden and Dial-up Service in and around our city, as well as High Speed Wireless Internet on Northwestern Ontario's largest Wireless Internet Network. Long Distance service at highly competitive rates, not only to customers of the Dryden 221 and 223 exchanges but to residential and business customers throughout Northwestern Ontario. Gateway to Canada's Heartland The Dryden Airport is operated by the City of Dryden and located 10 km (6 miles) from Dryden, ON on Airport Road. There is a comfortable, modern passenger terminal. Scheduled Air Services at the Dryden Regional Airport are provided by Bearskin Airlines with connections to Air Canada, Northwest Airlines and WestJet. Aircraft charter services are provided by Hicks & Lawrence and Superior Helipcopters. National Car Rental operates a booth at the terminal. Gas Bar, Convenience Store and Postal Outlet offering Bait, Tackle, Maps, Licenses, Fishing Supplies, Souvenirs, Gas/Propane, and General Food Items. ...Take a self-guided tour of the farm. Our Animal Park hosts a variety of common and exotic farm animals such as sheep, elk, bison, llamas, yaks, emus and much more. Guided tours are available. Call for rates. ...See our craftspeople at work creating a variety of fine sheepskin products. ...Visit one of Canada's largest wool and sheepskin specialty shops and enjoy a leisurely shopping experience - 3000 sq. ft. of sheepskin mitts, slippers, hats, auto accessories, leather and oilskin jackets, wool blankets, sweaters and more. Or write for a free comprehensive booklet listing our products available. Quality, precision and reliability, Flexfish(TM) Ltd. offers a variety of species, features, and mounts. The Flexfish team is committed to making things easy for you, our valued customer, by handling all aspects of the completion of your catch and release trophy from start to finish. Welding Repairs, Props, Skegs, Aluminum, Steel & Stainless Steel Welding/Fabrication, Boat, Trailer & Big/Small Whatever Repair. Pickup and Delivery Available. Rugged one Piece Pine Boat Paddles for Sale. For all your aluminum boating needs. Give us a call! Lund Boats - made by fishermen for fishermen. I'm an outdoor journalist, broadcaster and professional angler living in Thunder Bay, Ontario, Canada. As a freelancer, I'm available for trips, consulting, and seminars. Our specialists are prepared to help you with all of your home furnishing, mattress and home decor decisions. We offer a complete range of quality furniture, appliances and bedding. Our knowledgeable staff is ready to listen to your needs and offer options that are tailored to each individual's needs. Guiding services by John Butts, In-Fisherman PWT Champion. Professional Walleye Angler, TV/Radio Host, Seminar Speaker, Outdoor Writer, National Marketing Director Fin-tech Tackle Company, President NPAA. Escape to beautiful Ontario and enjoy a relaxing vacation at the 100% Nonsmoking/Pet Free Holiday Inn Express Hotel - Dryden, Ontario. Our hotel's location is convenient to the Dryden Regional Airport (YHD) and the Trans-Canada Highway. Our hotel's guests are welcome to utilize the 24-hour internet centre and 80-square metre meeting room. Unique among Dryden, Ontario hotels, we offer a complimentary hot breakfast bar each morning and a complimentary soup meal on select nights. We have an indoor pool, steam room and fitness centre, and each room has a triple-sheeted bed, a TV and a work area with a desk, a chair and free high-speed, hard wired and Wi-Fi access. Offering building materials, hardware, paints, stains, electrical supplies, plumbing, housewares, and cleaning supplies. Your One Stop Lumber Company. Huge Variety. Yamaha, Mercury, Ski-Doo, Alumacraft and Can-Am Dealer. For all your snowmobile and ATV parts, sales and service, lawn and garden equipment, and boats and outboard motors look no further! Whether you are looking to find the perfect Family Home, expand your present business, dreaming of owning your own Resort and being "The Boss", finding your own dream waterfront "Escape", Hunting for that much desired "Hunting land", or selling it all and retiring, Latitude 50 Realty Inc. can help make it happen!. Your One-Stop Real Estate source for Resort, Waterfront & Recreational Properties in Northwestern Ontario! Offering Brochures, Catalogues & Books, Business Products & Services, General Printing, Wedding Stationery 'Packages', Calendars, Business Identity Products, Web Site Design, Wide Format Printing, lake & depth maps. We combine graphic design and print production to create great projects for our customers. For all your legal needs - Business Law, Wills & Estates, Real Estate, Family Law, Employment Law, Criminal Law, Contract Law, Civil Litigation, Environmental & Natural Resources Law, and Municipal Law. Number one on the water - Mercury Marine is the world's leading manufacturer of marine propulsion engines and technology. MidWest Outdoors is dedicated to helping people enjoy the outdoors. We are an outdoors multi-media company serving fishermen and hunters in the upper Midwest with information on local and regional waters and woods. MidWest Outdoors also works with outdoors industry companies and organizations in helping them to reach the market place with advertising, video and print production, direct mail, and merchandising campaigns, and more. Morgan Esso is an ESSO bulk fuel reseller as well as ESSO and MOBIL lubricants distributor. We offer six locations with offices and bulk plant facilities in Sioux Lookout, Pickle Lake, Dryden, Kenora, Vermilion Bay, and Oak Bluff, MB. Our service area includes Sioux Lookout, Dryden, Kenora, Vermilion Bay, Hudson, Lac Seul, Silver Dollar, Savant Lake, Pickle Lake, Mishkeegogamang, and all first nations communities north of Sioux Lookout. Sioux Lookout is a renowned, year-round tourist destination. Visitors and residents alike take advantage of a wide variety of outdoor recreational and sporting opportunities including water sports, hiking, crosscountry skiing, snowmobiling and incredible fishing! Whether you are considering a visit to our community, or a permanent move, we welcome you to this beautiful and unique wilderness community that we call home! Promoting research, education and conservation of Muskellenge in Canada. Join our North Western Chapter. Whether it is the fishing trip, opening the camp, picking up supplies and guests or just the Sunday drive, National Car Rental has the right vehicle to meet your needs. Compact cars to full-size cars, minivans, SUVs, 4x4 trucks, 15 passenger, cargo vans, and moving trucks. Are you looking for a versatile, high-efficient, low-maintenance solution to your hot water needs? Check out our Evacuated Solar Tubes. Hot water for kitchens, showers, laundry, heating and hot tubs. Are you looking for a 10KW Grid-tie Solar System? Try our Sunranger Solar Energy System - maximum return with minimal risk. Outdoor News, Inc. publishes for outdoor enthusiasts across the Midwest and Northeast, publishing separate, state-specific outdoor newspapers and websites in Minnesota, Wisconsin, Michigan, Ohio, Pennsylvania, New York and Illinois. Outdoor News is a paid circulation newspaper devoted to covering the outdoors. 600,000 Acres of Land, Lakes & Lodges, Yours to Explore. Discover more about this vast area, teaming with natural beauty and wildlife. 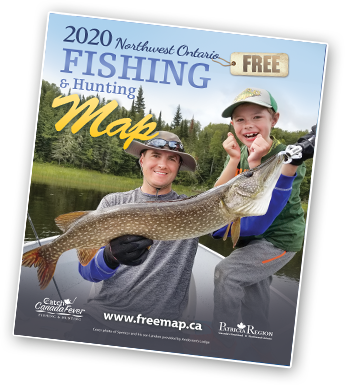 Enjoy some of the best fishing Ontario has to offer on any of the many lakes located within this unique watershed. The Perrault Falls Adventure Area is an organization representing the quality lodges and outfitters located within it's boundaries, and is dedicated maintaining it's quality outdoor adventures for generations to come. Visit our area website for valuable information and links to help you plan your next vacation in the north. Creating websites since 1997, Doug Lampi and Quetico Internet Marketing provide year-round marketing plans for seasonal tourism, travel and adventure businesses. As your Online Traffic Specialist, we provide proven methods for consistently achieving top rankings. We work closely to orchestrate your Lodge website, blog, social media and email list to create engagement with your content, lasting top rankings in the search engines and a regular stream of happy customer testimonials! Since we opened our doors in 1864, RBC has grown to become one of North America's leading diversified financial services companies providing banking, wealth management, insurance and capital markets services on a global basis. We demonstrate our vision of "always earning the right to be our clients' first choice" through our values -- service, teamwork, responsibility, diversity and integrity. Talk to us about all your financial and banking needs. FISHING AS MOTHER NATURE INTENDED On 1000's of wilderness and end of the road lakes. Serving Northwestern Ontario & North Eastern Manitoba. Conducting charters to small communities in northwestern Ontario and Manitoba. We specialize in finding innovative solutions to weather monitoring for industry. Finding the best mix of durability, reliability and cost in weather instruments isn't always easy - put our 40 years experience to work for you! Souvenirs, Maps and US Currency Exchange available at 11 First Ave. S. in Sioux Lookout. Pick up your FREE Northern Experience Magazine A warm welcome awaits you. The Sioux Lookout Master Angler Program is dedicated to recognizing the accomplishments of a single angler, who in the given year participated in the Master Angler Release Awards Program, entering as many releases possible in each species division. We are a non-profit, conservation based Catch and Live Release Program, operated by a group of volunteers. As members of various Fisheries Advisory Committees, our goal is to ensure that the Sioux Lookout District continues to provide excellent angling experiences in both quality and quantity for years to come while sustaining our fish resources. We are a custom embroidery and screen printing company focusing on creating top quality work that our customers can count on. Our customers have access to over a million products and styles through our top-quality suppliers. Enjoy browsing through our supplier's websites for ideas for promotional items, apparel items, or hats. The Standard Insurance has been providing risk management and financial services to their clients since 1897. As local members of the community, the staff at The Standard are familiar with the unique needs of living in central Canada (Northwestern Ontario, Manitoba & Saskatchewan). At The Standard, our customers are our top priority and our experienced team of advisors look forward to taking care of the things that matter most in your life. Steven Blair Contracting Ltd. has been in business for 28 years starting as a single owner operator truck to at present consisting of 8 trucks with 20 types of trailers including gravel bellydumps, enddumps, low beds with booster and jeep attachments, wood trailers, and a water tanker. We have 10 pieces of heavy equipment including dozers, backhoes, compactor and loaders as well. For low bedding we haul any type of equipment and accessories Canada wide. We excavate and supply gravel products for road building and site preparation as well as backfilling and compaction. We also have experienced septic field installers for doing septic fields. In the winter months we snowplow as well. At Sun Life Financial, our business is to help our customers achieve lifetime financial security. We have financial centres across the country, and our advisors form the largest exclusive life, health and wealth insurance distribution network in Canada. Call for health and life insurance and investment options to suit you. Bait & Tackle Shop offering the finest selection in All Types of Bait, Tackle, Maps, Licenses, and Fishing Supplies. Sunset Country Realty Inc. is a young, vibrant, full service real estate company offering Residential, Rural, Recreational, Commercial, Leasing and Property Management, and Appraisal services, plus National and International Relocation Services. Lakefront, urban, rural and commercial... we list every type of property, and keep those listings up to date on this web site, so that you have easy, fast & reliable access to all our real estate listings. Dryden Walleye Masters - a Catch & Release Walleye Fishing Tournament held annually on the Wabigoon Chain of Lakes, with an excellent prize structure of over $40,000. Visit our website for registration details and further information. Our extremely wide range of Taxidermy services caters to Rugs, Fish mounts, Game heads, Exotic specimens, Arctic game, Trophy mounts, etc. which ensures that no customer is ever turned back or disappointed while dealing with us. With a competent, experienced and skilled set of employees, who have over several decades of experience, we see to it that all our customers needs are satisfied to the core. Dryden's Largest Floral and Gift Shop, centrally located in downtown Dryden. Specializing in fresh and artificial floral products and gift baskets for any occasion. Delivering locally and world wide. Home of "Canadian Pure Wild Rice" local wild rice and cook book. Wholesale live bait - minnows and leeches. We offer spruce lumber & plywood, pressure treated lumber, insulation, siding, paint, plumbing, electrical, general hardware, kitchen & bath cabinets, roof trusses, septic tanks, windows, doors, masonry products, paving stones, blocks, and a garden centre. The Township of Pickle Lake is located at the end of highway 599 in Ontario. There is something exciting about "the end of the road" and this phrase brings with it an image of wilderness. Our slogan of "The Last Frontier" is truly the feeling that you get after you have traveled the distance to our community. ...It's "Music in the Woods" Every August the Trout Forest Music Festival is staged at the Ear Falls Waterfront Park, just one hour north of Vermillion Bay on Highway 105. Camping on the shores of the English River, part of the Historic Red Lake Gold Rush Trail, and the late night jam sessions around the bonfires make for a memorable experience of Music in the Woods. The "Trout" features workshops, creative arts selection, great food and the best in Northern hospitality with the beautiful Trout Lake Forest as a pristine backdrop. We provide complete sales and service support for all print document systems, stationery, furniture, and computer products offered. Wilson's currently has retail stores with knowledgable sales/service staff located in Dryden, Kenora, Fort Frances, Red Lake, Sioux Lookout, Thunder Bay and Thompson, Manitoba. We also have a fleet of aircraft used to serve the more remote parts of Northern Manitoba & Ontario. Our phrase "Service Built Us" is no idle boast, the truth of which you will come to know as we work hard to earn your business. For all your accounting, auditing & taxation needs. Year Round Drilling. Call us for all your drilling needs. We guarantee water. Water Wells, Angle & Anchor Hole Drilling, Pressure Grouting, Pump Sales and Hydro Fracturing. A Team Dedicated to Providing Total Customer Satisfaction by Delivering the Ultimate Boating Experience! We are confident that whatever you may require in a fishing, skiing, runabout, pontoon, cabin cruiser or personal watercraft (PWC), Woodlake Marine can supply the boat of your dreams. If Bottled Water isn't a good choice for you, World of Water Kenora Has World Leading Technology's and Breakthrough Water Treatment options like: Zenon Homespring by GE Canada, or Sterilight UV, plus many many more including home Reverse Osmosis Systems. We also carry Water Treatment Drinking system's for those avid Boaters that like to relax on the lake and take it all in on those hot summer days. With Yamaha four-stroke reliability behind you, every customer wins! We sell motorcycles, ATVs, side by sides, snowmobiles, scooters, boats, outboard motors, wave runners, power equipment, accessories, and apparel.